It’s Stephen King’s birthday this week. Saturday, to be exact. I’ve been a Stephen King fan for quite some time now. I picked up Pet Semetary when I was in ninth grade. At the time, everyone was passing around VC Andrews’ Flowers in the Attic series. And while incestuous sibling relationships and psychotic grandmothers were interesting, I found that my angst-filled teenage youth craved something much darker. I threw the book across the room. Something about that blunt statement scared the absolute bejeezus out of me. It helped that it was late at night, that I was the only one up, that my roommate was snoring sporadically. But bottom line, I was scared. And I was hooked. The Shining came next. To this day, I cannot walk between hedges and not think that they are somehow moving closer to me. Even in Disney World, those happy Mickey and Minnie topiaries seem far sinister than the smiling tourists realize. I see them posing in front of those leafy effigies at the top of Main Street USA and I swear I see Mickeys grin extend a bit wider than normal, his eyebrows furrow. And when did he get teeth? I grabbed every Stephen King book I could find – an easy thing to do considering the rate at which he publishes – and since I was a bit late to the party, I had a lot to choose from. I read Misery in one night, finishing it at 4:30 AM. It remains the only book I ever read in one sitting. Not even Harry Potter was able to do that. I bought The Bachman Books and read those. Picked up Salem’s Lot and discovered vampires the way they were meant to be discovered. Cujo became the catchword for every mangy mutt that wandered without a leash around the boardwalk where I grew up (“Stay away from that cute pup – it’s a Cujo.”). And now, whenever I go through the Lincoln Tunnel in New York, all I can imagine is Larry Underwood’s terror filled walk through the pitch dark, body filled tunnel in The Stand. As I searched for King, I didn’t discriminate. I loved The Eyes of the Dragon, my pre-cursor to all things fantasy, and no doubt the reason for my Harry Potter obsession years later. His collections of short stories were my favorites. The Mist was one of those stories everyone tried to retell at camp, but no one could ever get it as good as the King and I would just roll my eyes and roast my marshmallows. 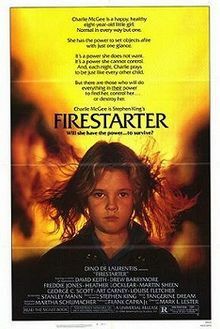 Firestarter convinced me that the government was hiding all knowledge of paranormal activity in this country, and more importantly, that there was some way I could harness it for myself. But in tenth grade I read The Body, the story that probably changed my life. That was when I decided that I wanted to be a writer. I loved the story so much that I convinced my friend to come with me on an adventure. We took our bikes and followed the railroad tracks near her home in upstate NY while I told stories and imagined myself looking for the body of Ray Brower. It’s remarkable that we weren’t killed by the vagrants we passed along the way. As a fledgling writer at age 16, I quickly became an arrogant critic. I was an authority on the writer who consumed most of my reading time, but who clearly could use some pointers from me, a brilliant teenager. I was kind of like that kid in Apt Pupil. But I wasn’t holding anyone hostage or cutting myself in private. My arrogance didn’t last too long. I thought I was a Jedi when in truth, it was too soon for me to leave Dagobah. With each book, I learned more and more. I read about King’s influences. I mimicked his style. I referenced his books in my papers for school (always met with a terse, “this is not an author of literary merit” comment from the teacher). My college thesis was on Horror and Literature. Take that, high school lit teacher. As I grew, so did he. My tastes changed. His writing changed. My obsession tapered off and was replaced by other authors, but he was always there, in the periphery. I can’t claim to have read all of his books – I never picked up The Dark Tower, I didn’t finish Hearts in Atlantis, and Under the Dome is still on my shelf waiting – but I can’t deny his influence on my writing and reading tastes. Happy Birthday, Mr. King, from one of your mostly constant readers. A great blog post. King is the paragon writer and novelist–not to mention an exemplary Virgo writer. I’ve noticed other virgo novelists have similar inclinations and writing habits. I know. Great minds think alike. Check out my blog post–a writer’s astrology. Dude! I love this blog!!! Dude! I love that you love this blog!!! I too am an avid Stephen King fan… even forcing myself to compete his novels that I just couldn’t believe he could have written (under the dome, for example was a snooze)…. his novel about thwartingthe jfk assassination was spectacular! Thank you! I loved that novel as well.